Merry Christmas and Happy Holidays! Our next reading clubs are only 2 weeks away! Sign up early and click here to submit your RSVP for our "Mysteries and Adventures" clubs on January 10. Feel free to help us recruit volunteers by joining our January 10th Facebook event, tweeting @readingtokids, emailing friends, or any other creative ways you have in mind. It's the final week of our 2014 Annual Fund Drive, and we have just six days to find 47 more donors to reach our goals! Donations are tax-deductible, too! Note: If donating by check, please make sure the check is dated on or before December 31, 2014. If donating by credit card, the donation must be made on or before December 31, 2014. 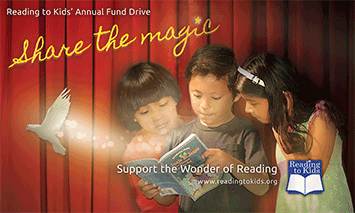 Thank you very much for donating to Reading to Kids, and happy holidays! - Help Us Find 47 Donors in 6 Days of Tax-Deductible Donations!